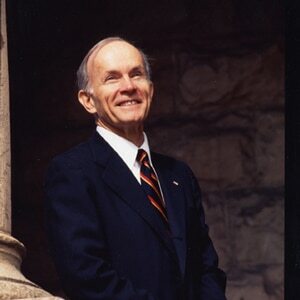 Dan Ritchie was the Chancellor of the University of Denver (known locally as DU) from 1989 through mid-2005, a particularly challenging time. Prior to that post, Ritchie was an executive at MCA-Universal and then CEO of Westinghouse Broadcasting before taking up ranching in Colorado. Ritchie is currently the Chairman and CEO of the Denver Center for the Performing Arts and Chairman Emeritus of DU. In the 1980s, DU was in crisis, borrowing money to make payroll with over $60 million in deferred maintenance on buildings. Ritchie enlisted cable television pioneer Bill Daniels, a leading proponent of values-based leadership, for financial support. Daniels donated $11 million as a challenge grant, asking the business school to incorporate business ethics into its core curriculum. During Ritchie’s tenure, a new university vision emerged (“To be a great private university dedicated to the public good”), backed up by a new set of shared values (“Excellence, Innovation, Engagement, Integrity, and Inclusiveness”). The school completed the largest fund-raising campaign in its history, constructing new buildings that now complement the Denver skyline. 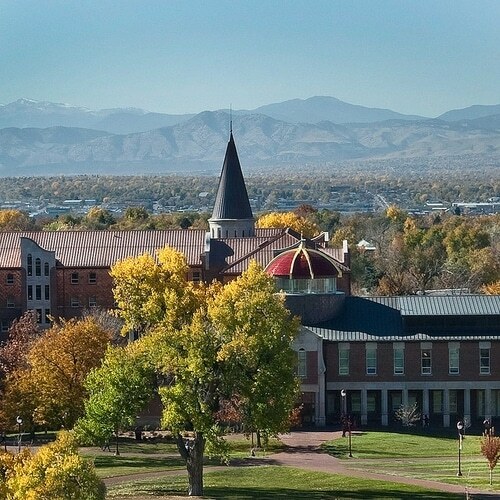 Ritchie donated much of his Colorado ranch to the university to match and underwrite donor grants. In 2011, Bloomberg Businessweek ranked DU’s Daniels College of Business second in the U.S. in ethics. 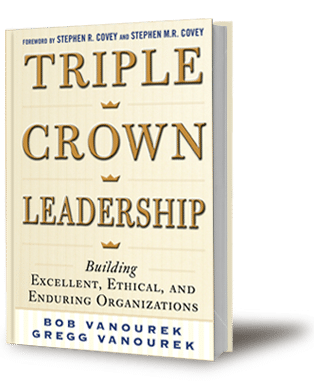 Here are excerpts of our interview with Dan Ritchie for Triple Crown Leadership. What was the situation when you arrived at DU? Ritchie: When I arrived, the approach was to hunker down and survive. One of the previous Chancellors was not entirely honest. In fact, I think the board was misled. The whole approach was top-down with some intimidation, low morale, and low expectations, all of which was contrary to what I believe in. If you go back in the early history of the university, we had very dedicated people who desperately cared about the institution and who practiced leadership accordingly, but it had fallen on very difficult times. So, your arrival must have been a shock? Ritchie: There was a lot of skepticism at first that I could be successful. We initiated a process of strategic thinking and planning. At that time, universities were not accustomed to strategic planning. They thought it was an alien concept brought in by these business people who didn’t understand academia. It took two and a half years to go through the strategic planning process. One of our board members said to me, “Dan, I could have done this in six weeks and done it better,” and he was right. But it wouldn’t have worked in that environment. You’ve got to plant the seeds and let the process develop. You can give it some guidance and feedback, some support and encouragement, but if it is perceived that this is just your idea that you’re shoving down their throats, either gently or not, it simply doesn’t work. Did the culture of the organization begin to change as well? Ritchie: It changed to belief in each other and to practicing trustworthiness. Everybody was used to gaming it, assuming the worst in everybody else. In time, that changed as people gained confidence and began to believe that people were putting the institution ahead of themselves and believing that we could be really terrific. We had a debate for a long time about whether we would be a Volkswagen, Chevrolet, Pontiac, Cadillac, or a Rolls Royce. Initially, people were eager to settle on Pontiac because that was a considerable improvement. But over time, I persuaded them–and others did as well–that Rolls Royce was possible and ought to be the objective. In those days, Rolls Royce was more admired than it is now. We looked around the country at those other institutions that were considered the best: the Ivies, Williams, Amherst, Stanford, and so on. I visited all of these places to see how we could improve on what they were doing. We decided we could not match the Harvards and Stanfords of the world in the quality of their graduate programs. We just didn’t have the resources or the time. But at the undergraduate level, you could see how we could do it better. We felt that teaching and practicing ethics in everything we did was important, that the world was slipping toward a lower and lower level of ethical practices. At the undergraduate level, universities were focused on test scores and the things that U.S. News & World Report measures and ranks, which are easy to measure. We knew that being smart wasn’t sufficient, that in time motivation trumps talent every time. If we played their game, we could never beat Harvard in scores, but we could beat Harvard in terms of the quality of our students and on the quality of our programs because they were really measuring the wrong thing. Teaching ethics was not important to them. If you were a chemistry teacher, you teach chemistry. You don’t use chemistry to teach ethics, or you don’t teach ethics as a part of your chemistry programs. That in our view was just simply wrong. It also meant that we had to practice it ourselves as a university. Teaching it and not practicing it doesn’t work. To give you an example, we had a championship hockey team that won the national championship in 2004 and 2005. In 2004, it was in Boston. We were in the Frozen Four, as it’s called, the final-four championship. In the semifinals, our star player scored the goal that won it for us 1-0. Before the finals, however, he broke one of our athletic program rules. It didn’t involve a crime, or even breaking the NCAA rules, but it broke our rules. The normal course of action would be to sit him out for the following game. Our coach, George Gwozdecky, asked, “What do we do?” I turned it back and said, “George, what do you think we should do?” He said, “We should sit him out.” So we did. It was in the national news that we had benched our star. We never told what rule he broke. He sat there in his street clothes during the game. That’s the kind of thing you need to do to demonstrate you’re serious about ethics. So, ethics is the foundation, not just in ethics courses, but in everything we teach and everything we do. The students themselves on their initiative decided it was good, voted it, and passed it. When they did, they said, “If it’s good for us, why isn’t it good for the faculty?” The faculty decided it was good for them. And then if it’s good for the students and faculty, why isn’t it good for the board for trustees? The board of trustees decided it was good for them too. So, they pushed it from the bottom up. That’s exactly how it should work. So, I called our folks back over here and told them about it and said, “What do you think about doing that?” There was a silence on the other end of the line. I thought I’d been disconnected. Anyway, we finally tried it on a trial basis. Each interview, with very few exceptions, was three on one, a faculty member, a staff member, and alum from the region in 33 cities across the country. That made an enormous difference in the quality of what we were getting. You can’t do it any other way. It sounds like there was a real transformation in the university during these years. What role did the board of trustees and the leadership team play in this transformation? Ritchie: Well, it was all of them. Sometimes you have to make tough decisions, but generally speaking they’re collective decisions, especially in academia, which is very much bottom-up. You can do things like my trip to India and the call back, but I didn’t say, “We’re going to do this.” By this time, I had begun to have a reputation that helped. At first, they didn’t believe anything I said, and at the end, too much the other way around. The board was completely supportive, actively involved, and understood. Did emotional intelligence play a hand in some of your personnel decisions? Ritchie: My favorite Greek saying is, “He whom the gods would destroy they first make angry.” You simply don’t let your emotions rule, and certainly not the emotions of anger, cruelty, or ego. Arrogance is probably the worst of all. I had a hockey coach who was verbally abusing his players as some coaches do. I told him that we just don’t do that here and not to do it again. He did do it again, and he was fired. So, you need to first give people encouragement to manage themselves, but, if ultimately they can’t, then you have to find somebody who can. Ritchie: I lean much more toward the empowerment-collaborative approach. You get more input from people who are closer to the frontlines, who live it every day. But there are times when you have to operate differently. I’ll give you an example. We were doing a search for the dean of the Daniels College of Business. That’s a particularly difficult position to fill because you have to have someone who can manage the academic side, is respected, understands the business side, and can communicate and can thrive in the business environment. Honestly, there are not many business school deans who do both well. So, we had a search committee composed of alumni, faculty, and a few students, and they came with two proposed choices. They were happy with either one, but I wasn’t happy. This had taken, as it usually does, a long time, and I thought they were way off base. The candidates were really quite acceptable academically, but not otherwise. So, contrary to the usual academic practice, I chose a different prospective dean and said to the faculty, “Vote him up or down. If you vote him down, we won’t appoint him.” I won, and he turned out to be a great dean for a long time. Was leadership in the organization concentrated or widely distributed during your tenure? Ritchie: It was widely distributed. One of the things we did that was really revolutionary was to establish something called gain-sharing, where, let’s say, the engineering department had a budget, and half of any money saved went into a fund to be spent any way within reason related to the mission of the department. You could spend it on anything that does not create future liabilities. You couldn’t hire permanent faculty. You could hire temporary faculty, or you could spend it on equipment. That alone changed the whole environment. When I left, there had been accumulated and unspent $30 million in this fund for the whole university. It’s amazing how thrifty they became. The old mentality was “spend it or lose it.” Now they had an incentive to save because they had the freedom to spend it on things that might be really creative and innovative. What in your opinion is great leadership? Ritchie: It’s partly respect, but it’s also putting the interests of your stakeholders ahead of your own. It’s built on integrity, respect, and humility. Arrogance is the worst of all sins because it includes all the others. Pride and envy come out of arrogance. An arrogant leader is the worst. It’s the idea of finding the balance between collaboration and inclusiveness and at the same time being able to make tough decisions promptly and correctly. During your years as the Chancellor, what did it feel like? I remember one graduation after we had developed probably the best program in the world for learning disabilities. There was a young man we admitted because of the interview, who had a terrible record at test-taking, but who we thought had the motivation. His family had really given up on him and set up a trust they controlled. It was quite a well-to-do family that owned a string of newspapers. He was totally transformed in terms of his family’s view of him and his view of himself and his capabilities. He walked out after graduation on the lawn. I saw him coming with his parents, grins this wide, and they had just given him one of their smaller newspapers to manage. They never thought he could even manage himself, much less that. What did it feel like? It was fun–a joy really. I don’t know of anything more gratifying than to see your people develop–to see your students graduate and do well.